National Security in the Information Age: Are We Heading Toward Big Brother? 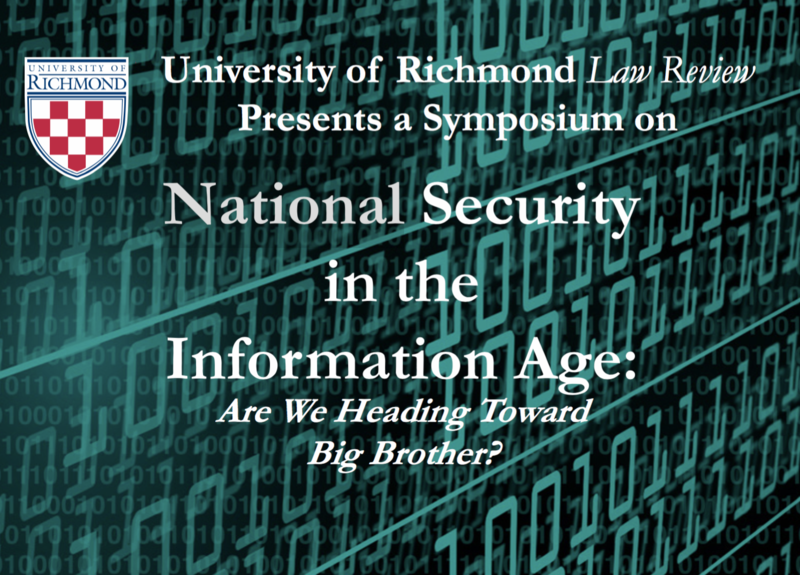 This symposium will discuss the recent developments in surveillance, classified information, and data security and focus on its implications abroad, at home, and in the courtroom. The event will also feature keynote speaker Tom Ridge, the first Secretary of the U.S. Department of Homeland Security. 3.5 MCLE credits are available to attendees of this event. The symposium will be held at the University of Richmond School of Law in the Moot Court Room from 9:00 AM to 5:00 PM. Admission is free and lunch is provided for all attendees. Please find the schedule below. Click here to download the relevant MCLE materials for this event. 9:15 — Panel Discussion: How Does the Government Collect Data Through Surveillance? 10:45 — Speech: How Does the Government Retain and Destroy Data? 1:00 — Panel: How Does Data Impact the Courtroom? The cocktail reception will be held in the University of Richmond School of Law Atrium. *Keynote does not qualify for MCLE credit.